Fried chicken has been described as comfort food, indulgence food, and fast food, but for the most part, any resemblance between fried chicken and sustainable food has been purely coincidental. 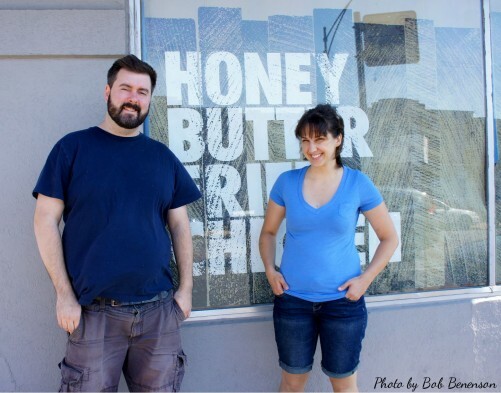 That is hardly the case, though, for Honey Butter Fried Chicken, a new restaurant created by two of Chicago’s most talented young chefs, whose much-anticipated grand opening arrives Saturday (Sept. 14). Christine Cikowski and Josh Kulp are sourcing Amish-raised chicken from Miller Poultry, a regional producer located about 160 miles from Chicago in northeastern Indiana. “We use responsibly raised chickens and the same goes for many of our products. We want a chicken that’s from the region, we’d like for them to be cage free, which these are, they are antibiotic free,” Kulp said. The same mindset applies to the seasonal vegetable dishes and market salad that Honey Butter Fried Chicken will be preparing as sides. The chef-owners became familiar with many of the region’s sustainable farmers during the six years that they ran the popular Sunday Dinner Burger stand at Green City, Chicago’s biggest farmers market, before they gave it up this year to focus on their restaurant buildout. 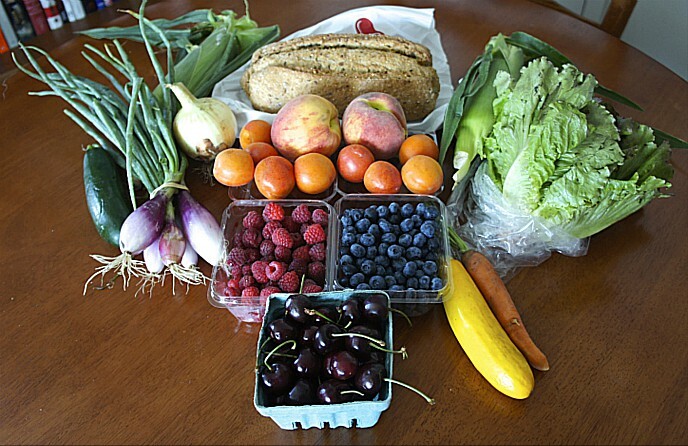 The produce they are using early on comes primarily from Green Acres Farm, a Green City fixture that is located just outside the Chicago metropolitan area in northwest Indiana. This emphasis on locally produced food has marked the careers of Kulp and Cikowski, friends since they met as culinary students at Chicago’s Kendall College about a decade ago. Local meats and vegetables have been prominent on the menus of their Sunday Dinner Club, an “underground” restaurant — meaning it does not have regular daily hours and attracts its clientele mainly through word of mouth — that is now located in a cozy suite upstairs from the street-level Honey Butter Fried Chicken. Not that something called Honey Butter Fried Chicken isn’t going to be indulgence food as well. Cikowski and Kulp added fried chicken to their Sunday Dinner Club repertoire early on, and it was an immediate hit. The honey butter part, according to Cikowski, came about somewhat by accident. She said that the butter was originally meant to go with corn cakes that they served with the chicken. 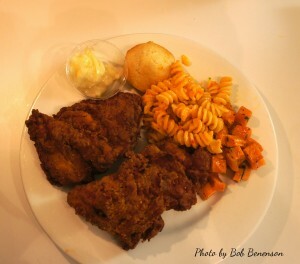 But during one Sunday Dinner meal, the staff was having its own fried chicken supper in the back when one of them dipped a piece of chicken in the honey butter. “We started dipping it in there, and it was revelatory, and I ran out to the dining room and people were like halfway done and I said, ‘Put the butter on the chicken, put it on!’ It was the honey and the butter and the salt. It just makes the spices on the chicken pop,” Cikowski said. Honey Butter Fried Chicken is located at the corner of Elston Ave. and Roscoe St. in Avondale, an off-the-beaten-path neighborhood about six miles northwest of downtown Chicago. 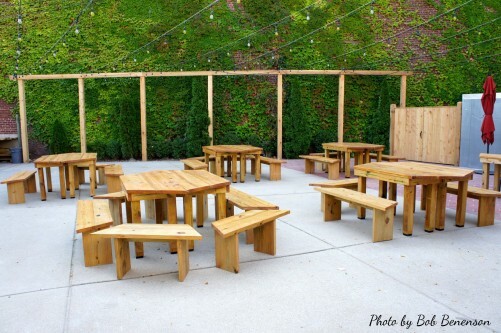 The large ComEd electrical utility facility across the street from the restaurant and its spacious backyard patio symbolizes the industrial, working-class history of Avondale, which long was a center for Chicago’s Polish-American community and now has a mainly Hispanic population. But over the past few years, Avondale has built a new reputation as a hub for what could be described as upscale versions of classic street food, helping to spur economic activity in a part of the city many customers wouldn’t have been able to find on a city map not long ago. Honey Butter is down a block on Roscoe from Hot Doug’s, a haute hot dog and sausage shop that regularly has a long line out the door. Kuma’s Corner, a gourmet burger place with a heavy metal vibe, is a couple of blocks away. Also in the vicinity are the Asian fusion restaurant Urban Belly; Fat Willy’s Rib Shack; and the Revolution craft brewery’s production facility and tasting room. Meanwhile, neighborhood stalwart Chief O’Neill’s, a longstanding pub that features traditional Irish music, is a couple of blocks north on Elston from Honey Butter. 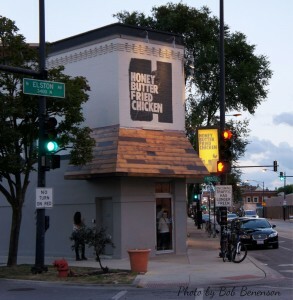 Honey Butter Fried Chicken is located at 3361 N. Elston Ave. Initially the restaurant, which has dine-in or carryout options, will be open only for dinner service: 5 p.m. to 11 p.m. Fridays and Saturdays and 5-10 Mondays, Wednesdays, Thursdays, and Sundays. (Closed Tuesdays.) The owners intend to add lunch service at a date to be determined. 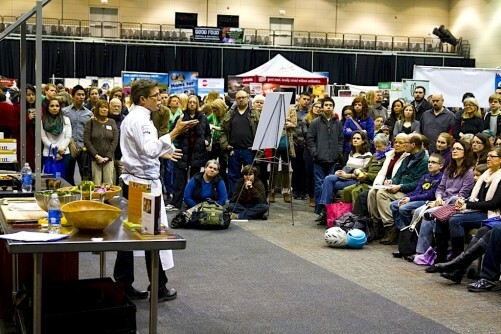 This entry was posted in Food Artisans, Meat, Poultry, Sustainable dining and tagged Chicago sustainable food, Food Entrepreneurs, Good Food movement, local food, sustainable dining, sustainable food, sustainable poultry. Bookmark the permalink. Wish they could pop up in Boston! Sounds great. Nicely written, Bob. Nice writing Bob. Makes me want to go there right away! Thanks, Dileep. We need to sit down and chat about regional wine again soon. Just went there last night for the first time. Never had HBFC before, even though they’ve been around at Green City. Chicken was fantastic and I’m not a huge fried chicken fan. I also don’t mind paying more for sustainable food. But, my only gripe is for a 2-piece for $8, you get just a tiny corn muffin and the honey butter. $3.50 for each side, when they are very small sides is just a bit much. I think the meals should come with a side, maybe charging a bit more. The other thing was the sandwich we got comes with nothing at all, and for the price I don’t think it’s fair. Great, great sandwich, but for some reason we got the smallest piece of chicken on the sandwich compared to everyone else we saw eating that night. It happens, I get it. We’ll see how the menu evolves a bit with the meals and sides. Cocktails and beer are great and well priced. The Hill Top is spot on drink to have with fried chicken. Bourbon and lemonade – never thought to mix the two. The space is great and so is the patio. 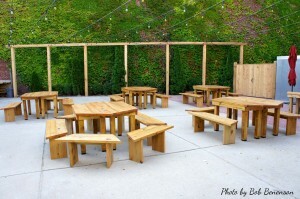 Love the location as well as it’s a quiet area close to other great spots in Avondale. Staff is great and very friendly. Looking forward to going back in a couple months. But seriously, I tried it last Sunday and it was delicious. Knowing that the birds don’t come from a CAFO makes it taste even better to me.